Norfolk Southern Corporation recently expanded its Intermodal Facility located on Industrial Road in Harrisburg PA. The $28 million dollar project was one of three located in greater central Pennsylvania. Intermodal transportation involves the use of two or more transportation modes (train, truck, ship) to move shipping containers and trailers from origin to destination. The equipment used to facilitate the movement of the shipping containers at the facility and the volume of trucks in and out places extreme demands on the pavement. 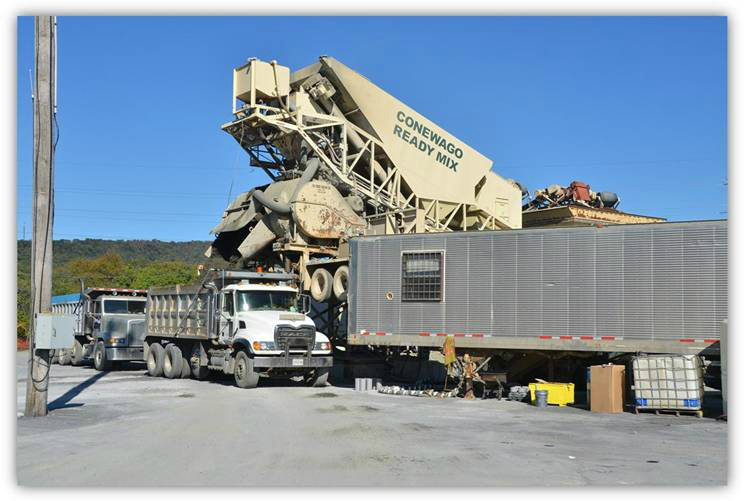 Norfolk Southern selected Roller Compacted Concrete (RCC) to meet those demands and Conewago Enterprises to produce and install the product. Why select RCC? RCC is used where strength, durability, and economy are primary needs. Ports, intermodal, and military facilities; parking, storage, and staging areas; streets, intersections, and low-speed roads are all perfect candidates for the technology. In addition, low cost continues to draw engineers, owners, and construction managers to RCC. Because paving did not begin until late October, fast track construction called for Conewago to complete the 35,000 cubic yard project in 22 days. The concrete was produced on site by a portable central mix plant. 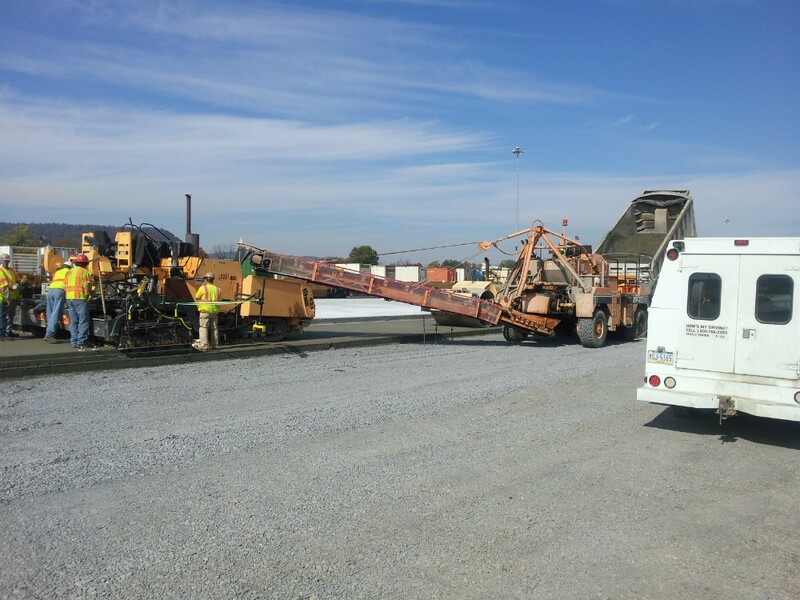 Portable plants provide an advantage on these types of projects because the concrete is placed within minutes of mixing. Such speed offers real and important advantages during cold winters and hot summers. Also, there is a much better flow of concrete and on site performance because all traffic issues are removed from the equation. In the end it is a much greener application. RCC is placed in lifts utilizing a paving machine. Depending on the type of equipment that is used to place the material (RCC may be placed with a high density machine or a conventional paver) the maximum thickness placed in one lift is about 10”. The Harrisburg project required 16” and 8” thicknesses, so the thicker section were placed by two high density pavers working in tandem. The process saw the paver placing the first lift fed directly via dump truck. The first lift was then rolled immediately. After rolling, a second paver (fed via a Material Transfer Vehicle) then placed the next lift directly on the initial lift. Following rolling, joints were cut into the pavement and it was sprayed with a membrane forming curing compound. Conewago Enterprises, Inc. is a multi-faceted organization that serves the needs of a variety of clients primarily in the Mid-Atlantic region. The company continues to serve both small local customers with projects under $10,000 to routinely undertaking the design and construction of $5 to $50 million hotels, corporate headquarters, regional operations centers, and medical facilities. 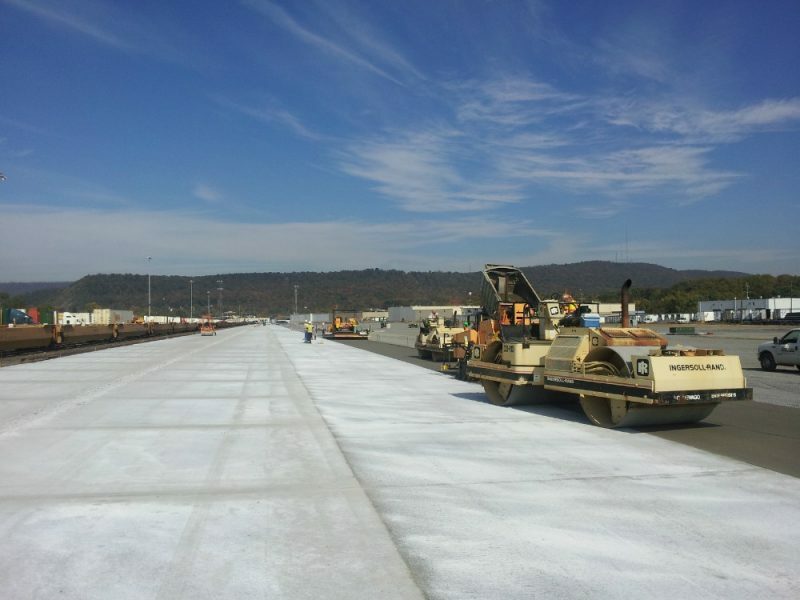 Do you have a project that requires a “tough duty” pavement? RCC may be the answer.